Clinical Instructor Wilson Petro explains to midwifery students at Mugana Hospital the procedures to follow to help a baby breathe. Photos by Frank Kimaro. In Tanzania, nursing and midwifery students in Kagera and Mara regions are more easily learning lifesaving clinical skills thanks to new computer labs, aptly-equipped clinical skills laboratories and well-stocked libraries. Since 2015, the U.S. Agency for International Development’s flagship Maternal and Child Survival Program (MCSP), in collaboration with the Government of Tanzania and in-country partners, has supported the revitalization of the nursing and midwifery schools by providing new computers, equipment, supplies and learning materials. These efforts are geared to improve the quality of nursing and midwifery services and expand access to high quality reproductive, maternal, newborn and child health services in the communities. The project targeted the Kagera and Mara regions because of the critical shortage of human resources for health. Seven of 10 nursing and midwifery schools in Kagera and Mara now have well-functioning computer labs, skills labs, and libraries, and all have met the national standards on continuous quality improvement standards for such institutions with MCSP support. Midwifery tutors and clinical instructors received training on basic emergency obstetric and newborn care, effective teaching skills, postpartum family planning, postnatal care, and integration of maternal, newborn, child health and HIV/AIDS services. About 2,600 graduates have been served through MCSP support in these two regions. 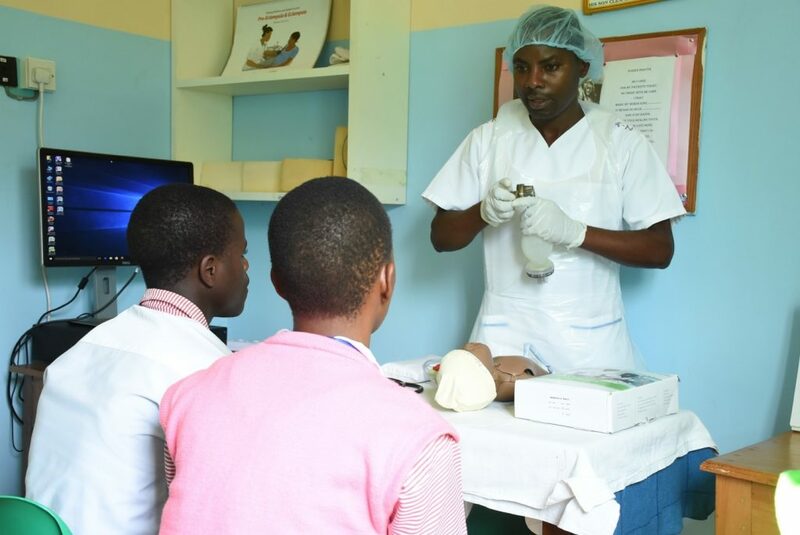 Wilson Petro, a clinical instructor at Mugana Hospital in Kagera region, a teaching hospital for St. Magdalene School of Nursing, noted that MCSP had strengthened on-the-job learning, allowing students and hospital staff the opportunity to practice their skills. Since December 2017, when Mugana Hospital started using the preceptor corner, a lot has changed. “Back then, if you were in the labor ward and something happened, let’s say a student forgot a certain procedure, it was hard to instruct them. Now we have a special room and materials given to us through the support of MCSP,” he said. He continued, “One day, a nursing student was assisting during an episiotomy procedure and wasn’t sure their surgical kit had the right equipment. She quickly dashed to the preceptor center to confirm what was required and made corrections.” Episiotomy is a surgical procedure that may be performed during a difficult labor to enlarge the opening for the baby to pass through. Mr. Petro added that MCSP provided life-size pregnancy-related models and visuals. Other materials MCSP provided include vital signs equipment, tape measures, pinard horns, kits for labor and delivery and newborn resuscitation, and training videos that help him and fellow tutors to better prepare and instruct nursing and midwifery students on how best to deliver a baby. MCSP operates in seven regions in Tanzania, including Mara, Kagera, Shinyanga, Simiyu, Tabora, Iringa, and Njombe, which serve a population of 10 million. In Kagera and Mara regions, MCSP collaborates with partners to strengthen human resources for health capacity and to improve the coverage, quality and sustainability of a fully integrated package of maternal and newborn health services in 221 health facilities. Also, in 19 districts of Kagera, Simiyu, Shinyanga and Tabora Regions, MCSP works to improve coverage of immunization services. A robust package of health services delivered by confident, skilled nurses and midwives can go a long way to prevent deaths of women and their children.